Yesterday, Jeremy Johnson from Johnson’s Garden Centers brought us some new toys to play with in the Demo Garden this year! 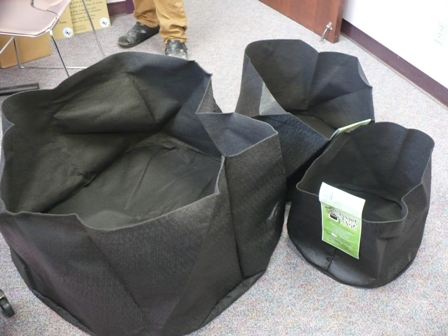 These are 3 “Smart Pots,” pots for container gardening or hydroponic gardening that are made out of a thick landscape/weed barrier type fabric rather than plastic or clay. The website touts the many benefits of these containers, including the ability to use heavier soils (cheaper potting mixes), cooler temperatures in the heat of summer (seems counter-intuitive, since they are black…), and better aeration & drainage for the roots. The fabric pots are also supposed to improve root pruning, preventing plants from becoming root bound. The three pots you see above are 15 gallons, 30 gallons, and 100 gallons. Yeah, that’s big! The 100 gallon pot is probably about the equivalent of a 4×4 raised bed. The only thing to decide now (other than where in the garden they will be tucked in), is what to plant in them! Tomatoes…cucumbers…peppers…oh my! Posted on February 11, 2010, in Around the Garden and tagged container gardening, container vegetables, gardening, vegetable gardening, vegetables. Bookmark the permalink. 7 Comments. I’ll be interested to see how those pots fare in Wichita. I looked into them for my own veggie gardening, but they sounded like they wouldn’t work so well in our humid summers with so much evaporation. Plus I worried about the black warming the soil too much so it burned the roots. But they’re obviously lighter than clay! The pots claim to be cooler than plastic pots, which I’m curious about too. The evaporation is probably the number one issue that I’m concerned about. I’m sure it’s evaporative cooling that does keep them cool. Charlene mentioned these at the Delano garden meeting, and I’m about half tempted to pull out some of my landscape fabric and sew some up, just for experimental purposes. I’m really curious as to whether it’d do well on top of pavement, but I don’t have any good sunny spots for that. Those look potentially interesting especially as they are screaming ‘make it yourself.’ I’ll be coming back to see how they do. I wonder how many years of use they’d put up with. It’s a good point…the evaporative cooling is probably what keeps them cooler, but that is also going to be a liability in Kansas summers unless you could rig it up with a drip system. They really do scream “make your own” too…I haven’t had the occasion to go see what straight weed-barrier fabric is available, but something made yourself would probably work just as well…if it works at all! I’ve been growing in and testing Smart Pots for seven years and I love them. Each year I grow a number of different plants that I had not tried before. The Smart Pots stay significantly cooler during the heat of summer due to evaporative cooling since the material is porous. A few years ago their was a research project conducted at the University of New Hampshire comparing the rootball temperatures in Smart Pots against traditional plastic containers. During the late afternoons of the hottest summer days the Smart Pots were as much as 20 degrees cooler than the plastic containers. The conclusion was that the roots in the Smart Pots were less thermo stressed than those in the plastic containers. As far as watering goes, they may require a little more watering but the jury is still out on this question. I find that on a hot summer day just about any mature plant ( tomato, pepper, zucchini, etc.) regardless of the type of container it’s planted in needs watering.